PureShare Business Value Dashboards – Business Value Dashboards (BVDs) transform metrics into a common language that both IT and the business can understand. 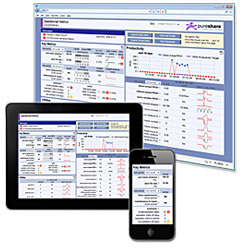 PureShare CCM2 – Automated, Consolidated Metrics for Contact Center Executives. Transforms operations and technical metrics into business-value views for stakeholders. Gain top-to-bottom transparency and optimize IT performance. A metrics automation and application development platform for developers, OEM and custom branded-applications. PureShare enables the transformation from the traditional reporting paradigm to an “Answers” paradigm. Our proactive metrics management products transform business interactions by providing managers, executives and staff with direct access to the answers they need – anytime and from anywhere.